The only onion trick I know that works worth a damn is to slice them underwater, but that’s a bit of a pain. I just cry and let it happen. 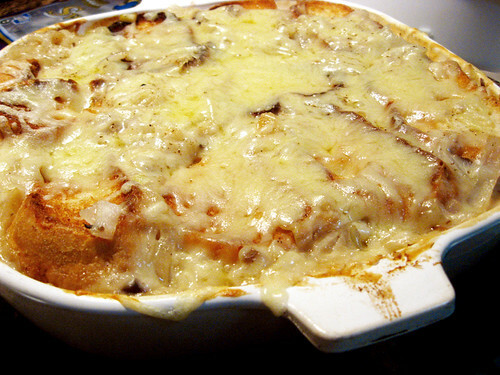 This recipe makes me wish I could still eat cheese. Oh this sounds delicious! well done lady! as far as the onions are concerned my little grandma in Iowa always suggests chewing gum while you slice… I have done this and it works out well, but it could be that I have great faith in her prairie magic! I’m sure it works, but, although this is rediculous to admit, I have a debilitating fear of gum. It just freaks me out. What can I say, we all have our irrational fears. Don’t we? Looks awesome! I may try it out for our 40-some people. As for onions, the collected wisdom of Harold McGee and Cooks Illustrated add up to barrier methods (goggles, contacts, etc) or a nearby open flame to oxidize the sulfur compounds. Both actually work, and I keep chemistry goggles in the kitchen for frying anyway. i’ve also heard that burning a candle close by helps. burns up the tear inducing gases maybe? this is my first comment, i found the blog by way of painfully hip. but i’ll admit to bookmarking the coq au vin post so i can ogle it at random hungry points in my day. that is some seriously delicious food pr0n. Hey Andrea! I absolutely love your blog and congrats on the Time Out Chicago Post. 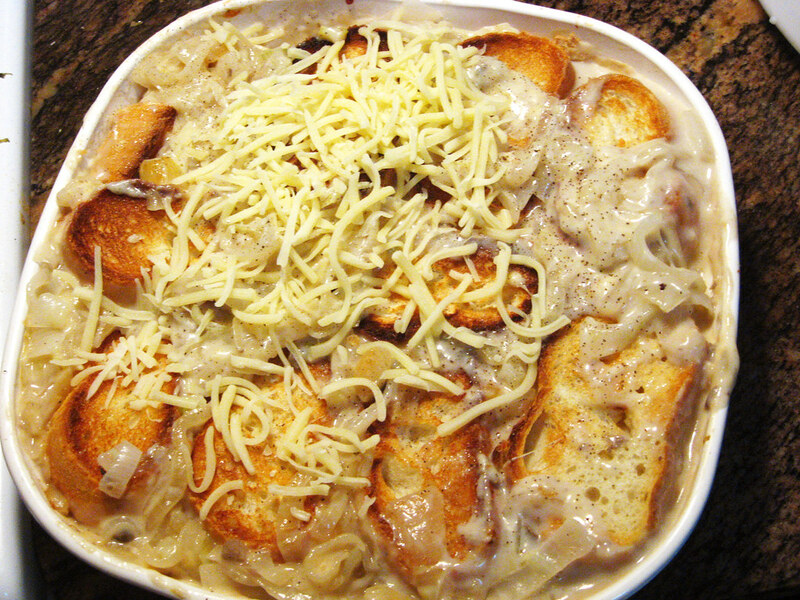 This onion bake looks amazing. I fully endorse the candle burning trick for onions- and yes it’s from Martha. I used to cry and burn so much i couldn’t open my eyes but having a candle on my cutting board does the trick. Not only are your recipes wonderful but your pictures are amazing! They make everything look absolutely tantalizing. Oh my God. So this is the first Forkable recipe I have tried to make, and I went to the store and was like, “What? THREE POUNDS of butter?” So I called you and it went straight to voicemail (so busy with local magazines calling you and all I guess). So I just bought three pounds of butter and came home and realize it says 3 tbs. So, hopefully you can publish some butter-heavy recipes in the next month. Just put it in the freezer, it’ll keep until you get around to using it all. I love the way your mind works. Three pounds of butter, that sounds like a recipe for a coronary. I’ve found turning on the stove (gas burner) helps with tears. Also, apparently a super-sharp knife will keep it to a minimum. OMG .. that looks so tasty. I may make a mini one just for me. My husband, darling man, hates cheese and onions. Freak of nature, I know. Lovely blog!! I adore it! Swimming googles make working with onions a tear-free experience. It also entertains any witnesses. Ha ha. I think swimming goggles are are an awesome idea! The candle – I’ve never heard of. The trick I got from Gordon Ramsay is – DON’T cut off the root end of the onion or through it! I peal the onion, cut off a small slice from the side (so there’s a level sitting area). 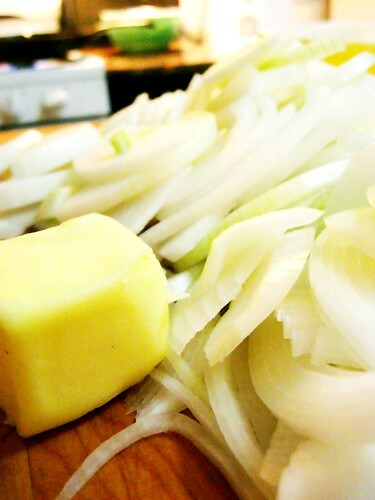 Then make a horizontal cut down the center toward the root end – set on flat side and cut away – tear free half circle onion slices! It’s all in the root! Huh! That’s interesting. I’ve never heard that before. I’ve got to give that a try! My mom, bless her heart, once told me to put onions in the freezer for 20 minutes before you cut ‘em. Not only has this worked time and time again for me, but friends who love to cook have tested the theory as well…it has yet to fail. Good luck! this is the best recipe for people that can’t cook and need to bring a dish to a potluck or holiday meal. I brought this to Thanksgiving last year (2008), and now it seems that it is part of the tradition! I am making it again for this years gathering, and was happy to see the recipe is still online. One warning — be careful if you can’t cook and you show up with this, because people will think you are an awesome cook they may have unrealistic expectations. They probably all think I could just whip up a homemade quiche. why don’t u have a button so I can print receipe??? I don’t see anything anywhere??? Sorry. I had one but the script malfunctioned. Its on the list to take care of. Chew gum when you slice onions. It works ! I didn’t see my tried and true tear buster when one is working with onions so here it is. Tear off a piece of bread and put it part way in your mouth. Evidently the bread absorbs the tear inducing ‘stuff’ before it reaches the eyes. 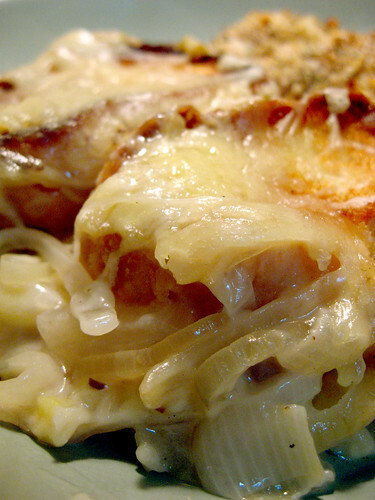 Thanks for the wonderful recipe for Cheesy Onion Bake. I LOVE this recipe and can’t wait to try it this Thanksgiving! I wanted to ask if I could share this on my blog’s Facebook page? 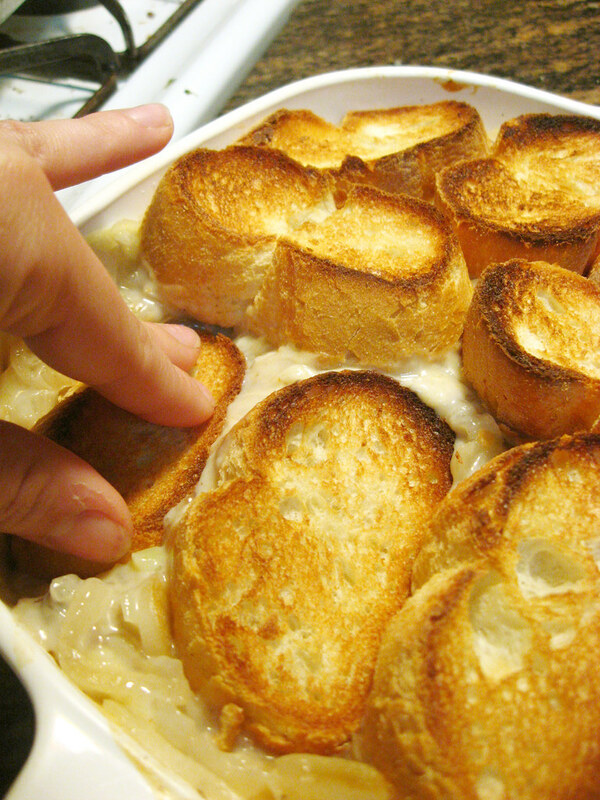 I would ONLY share a picture with a link that directs people to your post to snag the recipe. I saw you recipe and had to hunt it down to find out who it belonged to, lots of people have taken your photo and recipe and claimed it as their own. SO GLAD I FOUND THE ORIGINAL SOURCE. I’ll check back…Thanks again for the great recipe share! Is your blog on Facebook? I’m a “home ec” teacher. Putting onions in the freezer for 20 minutes before cutting absolutely works!